Glenn Irwin retained the Sunflower Trophy at Bishopscourt on Saturday as he won the feature event by half a second from Michael Laverty. The PBM Be Wiser Ducati rider battled his way through from sixth place in the wet to hit the front on the sixth lap. MD Racing Suzuki rider Carl Phillips was third, followed by Danny Buchan, Alastair Seeley and Adam McLean. Irwin won the opening Superbike race of the meeting on Friday, with Buchan taking victory in the second race. Essex rider Buchan, the winner of the Sunflower in 2014 and 2015, was a comfortable winner over Irwin and Ross Patterson, with Laverty fourth on a damp but drying track. Buchan, the British Superstock 1000cc champion, was on board an MSS Colchester-backed Kawasaki. Tyco BMW rider Laverty had the consolation of setting the fastest lap of the Sunflower race but was unable to close the gap on Carrickfergus rider Irwin. Irwin won the main race at the North West 200 in May and also took his maiden British Superbike triumph at Silverstone in September. He will compete for his Cumbrian-based team for the third season in a row in British Superbikes in 2018. 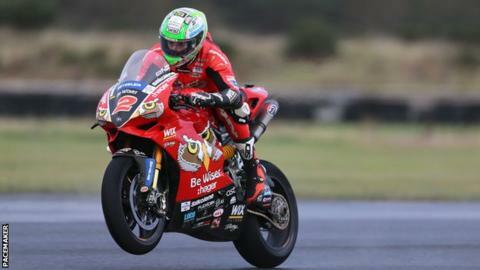 The 27-year-old came home 1.7 seconds ahead of Laverty in Friday's Superbike outing at the County Down track, with Buchan a further five seconds back in third. Seeley was fourth on the IFS R1 Yamaha, eight and a half seconds behind Irwin after eight laps, with Phillips fifth and newly crowned Irish Superbike champion Charles Stuart sixth. Lap record holder Irwin clinched a dominant treble at the event a year ago, including a maiden triumph in the Sunflower race. Toomebridge rider Laverty is the most successful rider in the history of the meeting with 18 victories in total, six of them in the feature race. Irish champion Jason Lynn was a double Supersport winner.